The OptiClimate is the only real all in solution for managing your interior climate and has the unique property of being able to cool or warm up or dehumidify, filter and circulate air at the same time. You are no longer dependent on the outside temperature and can experience the perfect climate, in summer and winter. You can even achieve the ideal temperature during a heat wave. The OptiClimate creates an optimal distribution of air in the room creating an even temperature. The temperatures can be exactly adjusted to your wishes and will be continuously maintained. 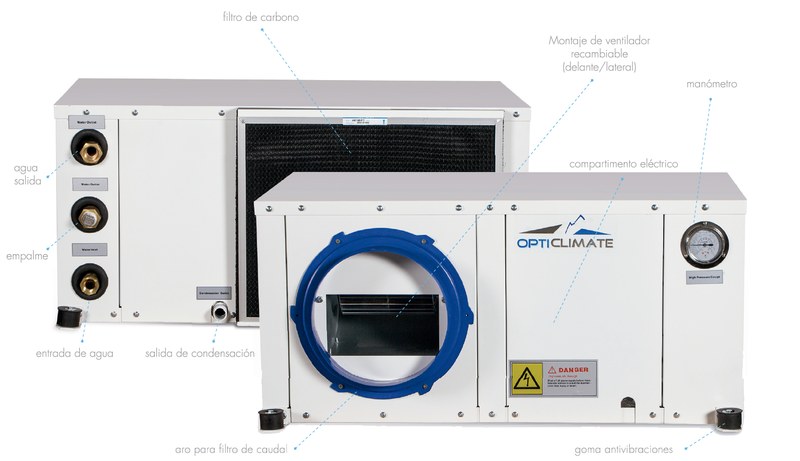 The OptiClimate is available in a water-cooled or air-cooled design. The 15000 model is also available with inverter technology.